Gently unfolding, yet profoundly shifting. I’m dreaming of creating a space, a closed container for some deep & slow work that evolves through the seasons over a full year. Each month we’ll spend a full day together; sitting in circle, sharing our stories, honouring the season and life cycles. Spend time in nature both together in song & alone in silence, with ears wide open – listening and seeing what emerges. We’ll also share sacred space by creating a container for conscious magical work, this is the way of the witch. It is a slow path. As women we often carry the karmic hurts of our ancestral line, and as wise women of our community, the free-thinkers, the moon watchers, the herb drinkers and spell weavers there is a collective memory of the burning times. A fear of being seen as wise and powerful in our own right, a habit of hiding our greatest gifts as priestess, seer, healer and midwife of the soul. We hide, often because we believe it’s safer to be in the shadows. But the world is calling. It is desperate times. The planet needs our healing hearts to hear and respond. Our communities want holding, and our rites of passage honouring. We have lost touch with the earth. It is time for re-connection both within and with-out. And so, I humbly offer this opportunity. 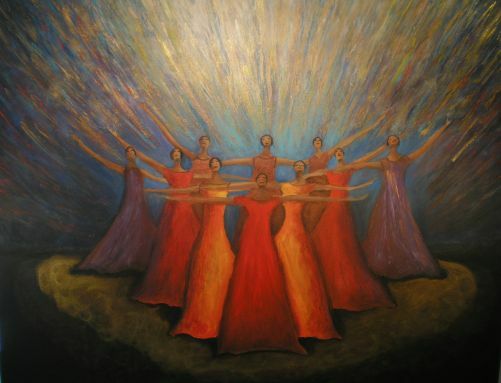 A sisterhood, a safe space to emerge and claim your birth right through self-initiation. A space in which to speak your deepest dreams and highest hopes, as well as dark fears and private angst. The land will listen, the trees will hold, the circle is strong. Bookings now open for February workshop at the Full Circle Sacred yurt space near Exeter (EX5 3JN) . Come, sit, feel into this space and see if you’d like to join the circle for a year. And register your interest if you’d like to join our virtual sisterhood circle later next year.